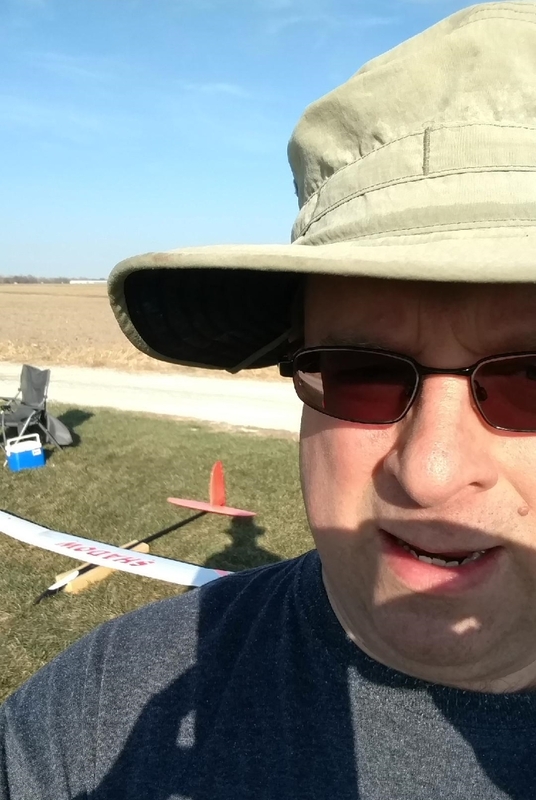 It was a beautiful day to fly this last Saturday as I was in the mid 50’s – low 60’s and sunny for a December day! When I showed up Ed was already setting up his Electric Eagle, me my Shadow, Wayne his 2M Sagitta, Duane his 2M Radian, Bob G his Viking, Jeff M his Gentle Lady. Everyone was finding lift but it wasn’t very strong everywhere. After several sorties, there was an accident in a booming thermal with Ed and Jeff and Ed’s won that contest with some damage to his wing. Well Jeff’s Lady wasn’t handled gently and the wing come off. The fuse went straight down and the wing kept rotating in lift horizontally and stayed up forever to land in the Busch property behind the levy/pine trees. It was to bad what happened. Then everyone left with Duane offering to get the turn around for me and I told him I would get it. As I was about half way down the line I Duane driving off into the sunset, decided that two flights weren’t enough at 14.5, and 13.5 minutes and driving all the way out to the field. So I gave it a launch with no wind as it was most of the day, and found a thermal after a couple of tires over the plowed corn filed towards the left side when looking north. I had some decent height and decided to see how it was where everyone was flying towards the right side by the big oak tree. That was fairly strong and up I went again. Then I noticed a hawk flying about! 400′ above and downwind of me over the Busch property. The hawk slowly came up wind and we kind of danced together with the hawk staying about 75′ above me at all times. When I would close the distance with him, he would scoot over some more. It was a lot of fun for about 10 minutes and he had enough and left the area. It was a lot of fun and I hope the guys can get everything repaired/replaced soon! It was definitely a good day to be out flying. Too bad about Jeff’s Gentle Lady, she got ravaged. His fuse came down in soft plowed and disced soil and is definitely repairable. All he needs is a replacement wing to be back in business. I’m sure that Bob Gill has something suitable in his hangar. My purpose in flying yesterday was to test my new f3-res high start rubber against my 32oz Sagitta 600. Since our rubber order got backordered, I only had 50′ of rubber on hand to work with. Since I adapted my old 4meter zip start for line, I only had 200′ of line. Stretching the rubber to 300% elongation (100′ pullback) produced a good pull. I didn’t have a fish scale but I would have guessed 8lb as advertised. Jeff thought it was too much for his Gentle Lady so for his flights he did not pull back as far. The breeze was 0-2mph and I was very interested to see how the Sagitta would go up without an appreciable breeze. I launched three times. It was a pretty gentle climb compared to my winch, but it did go up, and I averaged 200′ +/- 5 feet according to my telemetry. Dave was right about the lift as I had an 8min and 15min flight from those 200′ launches. Overall, I was very impressed with the new rubber, I think it will handle any 2meter just fine. It ought to be really good for the new 15oz f3-res planes that are being built. I think everyone is going to be very pleased. Very interesting, Wayne, thanks for the report. I was quite curious to see what you would discover. That’s pretty darn good to get 200 feet out of a hi-start that’s 250′ unstretched. Better than I would have guessed. I’m guessing that if you had the regulation 100 meters of line, for a total length of about 380 feet, you’d get a somewhat smaller percentage of total length, maybe a launch of 250′ – 300′. Presumably the ultralight F3RES planes would get higher — although maybe not by much, since most of them have smaller wing areas and will have less ability to lift the rubber. Anyway, we’ll all gain more experience when the season starts and we try different planes in different wind conditions. I don’t have a plane yet but I do have a box of wood. The most important thing I think that came out of this test, is that a regular 30oz two-meter can go up on this f3-res high start rubber just fine. Even without a breeze. Now I am really eager to see what one of the lighter ships will go up like. And what it will look like with the longer high start dimensions.